Having housing with a key, a lock, a mailbox…those are some of the tangibles that veterans who have been homeless truly appreciate when they come to Volunteers of America. A donation to our local office helps veterans who are homeless and veterans at imminent risk of homelessness. Whether a veteran in need benefits from our services of transitional housing, housing supports, job search and placement or life skill building you’ll know your donation makes a difference. We have a dedicated team who cares at the beginning of the day what the results are at the end of the day. Results look like a sigh of relief, a grateful hug, and prayers of thanksgiving. Each dollar results in access to a key. “Home is where the heart is” but with no roof overhead the heart does not have what it needs. Everyone deserves an adequate place to call home. The management and maintenance of Housing for those who are often underserved is no little thing. It is a big thing. Your dollars make an incredible difference. With many properties throughout North Carolina and South Carolina that is a whole lot of heart. 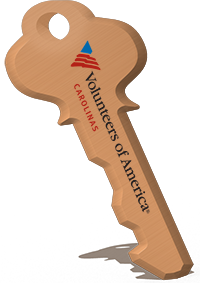 To make a donation visit http://supportcarolinas.volunteersofamerica.org/site/Donation2?df_id=12940&12940.donation=form1.